Two Tanzanian men caught with 16 ostrich eggs were sentenced to 25 years in jail yesterday after being convicted of "economic sabotage". 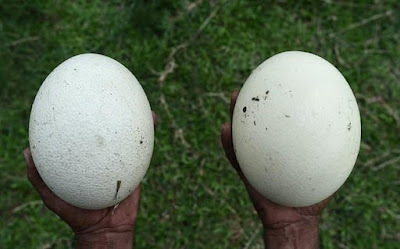 The sale of ostrich eggs, used in traditional medicine or to make tourist gifts, is illegal in Tanzania. Judge Ismael Ngaila sentenced Matiko Marwa, 32, and Julius Marwa, 42, to 25 years each. At the time of their arrest in December 2016, the two men said they planned to sell the eggs in neighbouring Kenya where they would be used in a purported AIDS cure.